When winter hits, gardeners must act quickly to protect their roses from snow and cold. Many traditionalists prefer the simple process of piling mulch around the base of rose bushes to insulate them as temperatures drop. But if you live in a windy area or one that is prone to erosion, a better method may be rose collars. These plastic, cylindrical "collars" fit around the base of rose plants and help roses go dormant, stabilize temperatures and hold soil in place to prevent erosion. They are easy to use and can help your roses make it through the winter. During winter, cold and fluctuating temperatures can damage the roots of roses, killing them or causing reduced growth in spring. During times of growth, roses' cells are full of water, but when temperatures drop abruptly, water freezes and damages cells. By applying protection such as rose collars, roses are eased into dormancy and encouraged to convert water into a substance that will not freeze, thus preventing damage. Rose collars help roses survive winter by keeping them in a dormant, non-growth state, stabilizing soil temperatures and preventing damage. Timing is crucial when applying rose collars. There are several things to consider prior to collaring. To best protect roses, stop fertilizing at the end of August to slow plant growth and encourage dormancy. 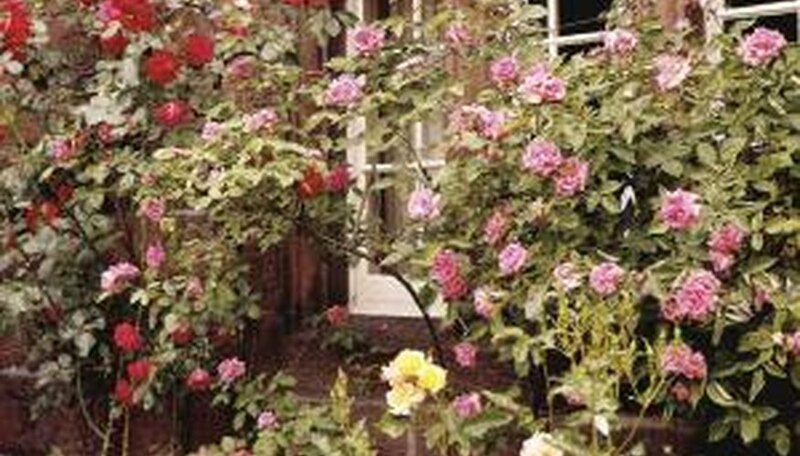 Remove any new shoots that appear on the rose bush in September to prevent them from freezing and damaging the plant. In September and throughout the fall, reduce watering and avoid major pruning. Only prune very long canes that could be cracked by wind or snow. When temperatures have dropped to 20 degrees Fahrenheit, insulate rose bushes with rose collars. Avoid collaring roses too early, as this will keep the soil too warm and prevent them from reaching dormancy. Place the rose collar around the base of the rosebush. Fill the space between the collar and the base with mulch such as leaves, pine needles, rotted manure, sawdust, wood chips or potting mix. Fill to the top of the rose collar. Cover the rose collar in straw for extra protection. All varieties of roses do not benefit from rose collars. Winter-hardy roses, including many miniature roses, shrubs and old garden varieties, need less protection and rose collars may not be necessary. Instead, simply pile up 4 to 6 inches of mulch around winter-hardy plants. Climbing varieties need special care to protect their long canes and cannot be accommodated by rose collars. Instead, leave the canes on their supports, pack straw around the canes, wrap the entire plant in burlap, and secure it in place with twine. The other option is to mulch the base of the plant and tie the canes to supports to prevent wind damage. Standard roses can benefit from being wrapped in straw-filled burlap up to the graft, or in some cases digging up the plant and storing it in a garage until spring arrives.